The recent motion picture, "Mission to Mars," takes as part of its premise that certain features in the Cydonia region of Mars were constructed as monuments by ancient Martians. This idea--widely popularized in books, magazines, tabloids and other news/infotainment media--has its origin in the chance observation (in 1976) by one of the Viking Orbiter spacecraft of a face-like hill. 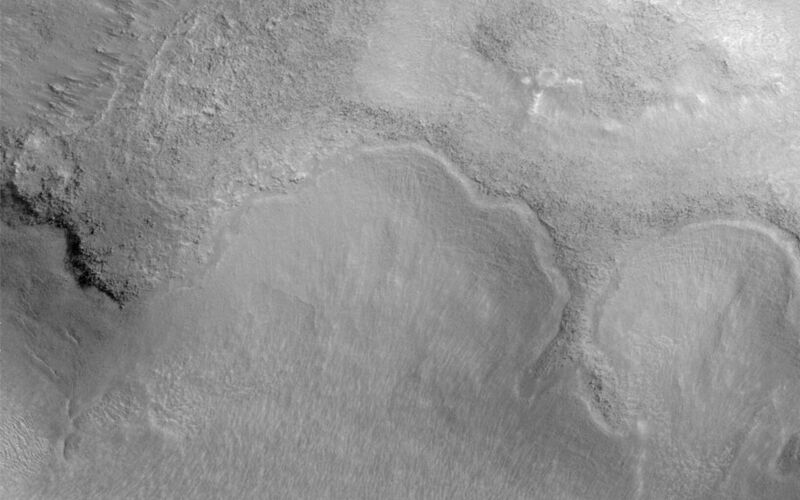 On April 5, 1998, the Mars Global Surveyor (MGS) spacecraft performed a specially-planned maneuver to photograph the "Face on Mars." 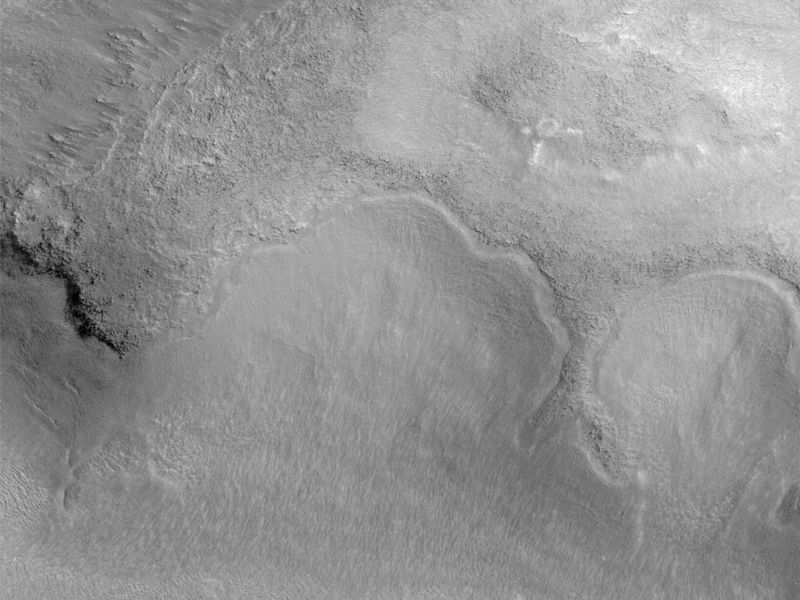 Having successfully imaged the "Face" on its first attempt, two additional maneuvers were used to observe other purported "artificial" features: the "City" (a cluster of small mountains west-southwest of the "Face") and the "City Square" (a group of four small hills surrounded by the larger mountains of the "City"). These special observations occurred during the Science Phasing Orbits period of the MGS mission, while the spacecraft was in a 12 hour, elliptical orbit. A year later, in March 1999, MGS attained its final, circular, polar Mapping Orbit, from which it has now subsequently observed the planet for a year. 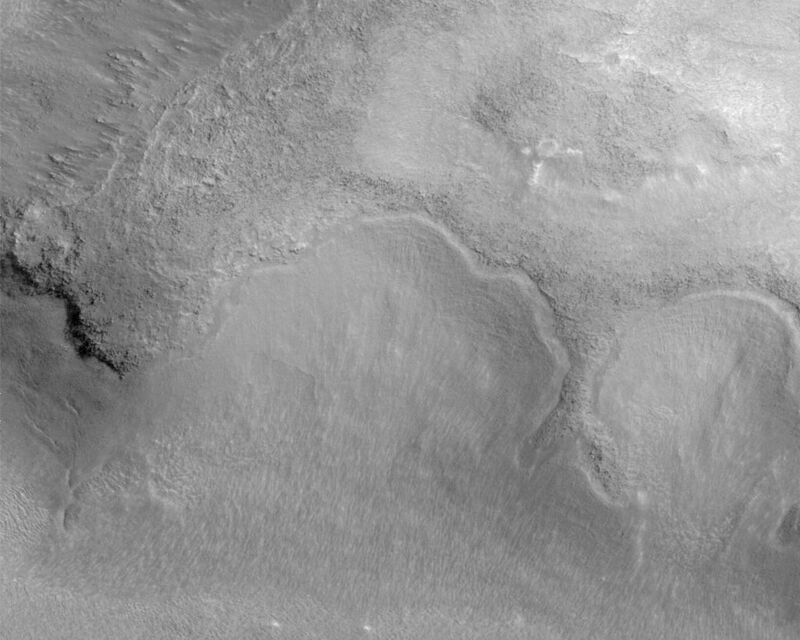 During this year of mapping, the Mars Orbiter Camera (MOC) has continued to make observations within the Cydonia region whenever the MGS spacecraft has flown over that area. The above figure shows the location of all high resolution (narrow angle) MOC images of the Cydonia region that have been obtained to date, including the first three taken in 1998 (PIA01240, PIA01241, AND PIA01440). These images are superimposed upon a mosaic of Viking images taken during the 1970's. Images acquired during the Science Phasing Orbit period of 1998 slant from bottom left to top right; Mapping Phase images (from 1999 and 2000) slant from lower right to upper left. Owing to the nature of the orbit, and in particular to the limitations on controlling the location of the orbit, the longitudinal distribution of images (left/right in the images above) is distinctly non-uniform. An attempt to take a picture of a portion of the "Face" itself in mid-February 2000 was foiled when the MGS spacecraft experienced a sequencing error and most of that day's data were not returned to Earth. Only the first 97 lines were received; the image's planned footprint is shown as a dashed box. This image is one in a series of eight.